The Holy Grail Body Transformation Program is written by Tom Venuto, who is the author of the best-selling e-book, Burn the Fat, Feed the Muscle. The program is based around losing fat and gaining muscle at the same time, which Venuto emphasizes is very difficult to achieve. This is why he calls his program the Holy Grail, because this outcome can be seen as the ultimate prize for many of those involved in bodybuilding and dieters interested in improving body composition. The first part of the book discusses the theory and science of gaining muscle and losing fat. Venuto explains that with most weight loss programs you lose muscle at the same time as losing fat but by using the Holy Grail techniques you will be able to gain a small amount of muscle while also losing fat. In the second section Venuto provides dieters with a detailed eating plan that is based on nutrient timing and nutritional periodization. This involves changes in the composition of your diet whereby for three days you consume a reduced calorie diet followed by one higher calorie day. You will also make adjustments in your daily nutrient intake and there is a particular emphasis on post-workout nutrition. Dieters are advised to eat within 30 minutes after finishing exercise and the meal should contain a combination of protein and carbohydrates. Liquid meals after workouts are recommended because they are absorbed more rapidly than whole foods. You can either use a commercial post-workout drink or make your own using ingredients such as whey protein and carbohydrate powders. Venuto says that if your primary goal is fat loss then you may be better off sticking with whole foods, even after your workout, because they provide more fiber and are better at satisfying your appetite. Dieters are also recommended to consume their two largest meals of the day as the pre and post-workout meals. These meals should also contain most of the carbohydrates. For the remainder of the day food intake will consist mostly of lean protein, healthy fats and green vegetables. Oatmeal, whey protein, egg whites, cottage cheese, low-fat yogurt, chicken breast, salmon, tuna, lean beef, potato, yams, brown rice, green beans, lettuce, broccoli, asparagus, tomato, onion, peppers, blueberries, oranges, banana, peanut butter, light salad dressing. The following is an example of a 1500-calorie low-carb day for women. An entire section of the Holy Grail Body Transformation is devoted to training recommendations and exercise is a very important part of this program. Resistance exercise is essential because this is the most effective way of building muscle. The Holy Grail program does not require that you follow a specific weight training regime however Venuto does provide some guidelines to adhere to so that you can obtain optimal results. Cardio exercise should also be performed 2-3 times per week for 20-50 minutes because this can improve muscle growth as well as improving fat loss. Dieters who wish to enhance fat loss can increase aerobic exercise to 4-7 days of the week. 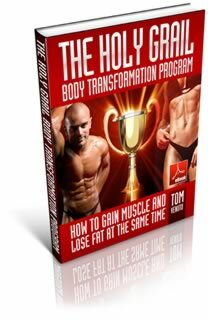 The Holy Grail Body Transformation Program is available in e-book format. Price varies – currently $47. Instantly download the book here. Increases the ability to burn fat and gain muscle at the same time. Does not require the restriction of carbohydrates. Periodic high-calorie days will make it easier to stick with long-term low-calorie dieting. Alternating calorie intake avoids the reduction in metabolism that generally occurs with prolonged calorie restriction. High protein intake helps to reduce appetite and maintain or build muscle mass. Addresses the importance of sleep and stress management. Meal planning is quite complicated and will involve calculating the amounts of calories, protein, carbohydrates and fats. Will be very difficult to eat in restaurants or social situations. Requires elimination of alcohol until desired results have been achieved. Does not include meal plans for vegans. The Holy Grail Body Transformation Program may help dieters to lose fat and gain muscle at the same time. Although results are not guaranteed, dieters can increase the likelihood of achieving this goal by following the recommendations outlined in this book.